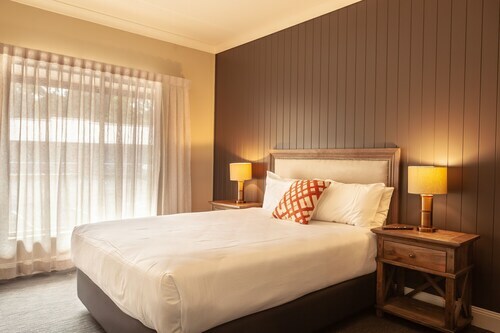 Located in the heart of Nowra, this motel is 2.5 mi (4.1 km) from Nowra Golf Course and 4.4 mi (7.1 km) from Shoalhaven Zoo. Booderee National Park is 18.9 mi (30.5 km) away. Situated in Nowra, this motel is 0.4 mi (0.7 km) from Stockland Nowra and within 12 mi (20 km) of Red Rocks Nature Reserve and Seven Mile Beach. Situated on a river, this motel is within 1 mi (2 km) of Stockland Nowra, Nowra Museum, and Nowra Golf Course. Meroogal and Shoalhaven Zoo are also within 3 mi (5 km). 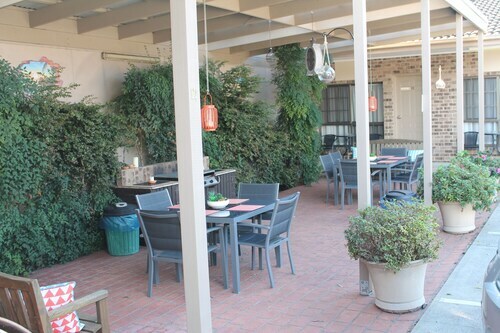 Located in the heart of Nowra, this motel is within a 15-minute walk of Nowra Museum and Stockland Nowra. Meroogal and Nowra Golf Course are also within 3 mi (5 km). A relaxed river city known for its nature-based activities, Nowra is the commercial centre of the New South Wales region of Shoalhaven. With secluded white beaches, national parks, old-style historic buildings and local restaurants within easy reach, it’s a fantastic place to kick back and unwind. Book your Nowra accommodation with us and save on your South Coast stay. Nowra is on the banks of the Shoalhaven River, and a long truss bridge over the water connects it to North Nowra and Bomaderry, a suburb known for Bomaderry Creek Walking Track. Visitors to the track can choose from two popular tourist walks through rainforest, spotted gum, swamps, sandstone and rock walls. But you’ll want to do more in Nowra than feed your face (although that’s always important!). See some spectacular sights on a river cruise through the serene waters of the Shoalhaven River. You’ll get the chance to take a long look and even snap some photos of the surrounding rocks, cliffs and escarpment. And that’s not the only incredible sight to see in Nowra. Ben’s Walk is a five kilometre track that follows the shoreline of the river through bush with a dazzling array of bird species and views of mountains and the golf course. Stop for a longer look at Hanging Rock Lookout, a 46m high rock that overlooks the river and shows you the green shore on the other side. Those seeking a little history will find it in Nowra. The Fleet Air Army Museum at the HMAS Albatross airfield is a two-storey exhibition centre packed with military memorabilia and some authentic Navy aircraft. Take a trip back to the mid 1880s with a guided tour of Meroogal, a house that was passed on through four generations of women from the same family. See furniture, photographs, clothes and even diaries (ooooh, sneaky!). Don’t forget Shoalhaven Zoo, the biggest zoo on the South Coast with over 100 different species. Once you’ve spent some time in Nowra, you might want to visit the rest of the Shoalhaven region to really get the most out of your relaxing trip. The surf at Shoalhaven Heads is some of the best on the South Coast. Jervis Bay is the perfect place to whale watch from June until November as humpbacks and southern right whales go about their yearly migration. Don’t forget to visit Hyams Beach, known for clifftop walking tracks and the whitest sand in the world! Is it time for YOUR yearly migration? Book your Nowra accommodation with us and you can make like the whales in the beautiful Shoalhaven region. How Much is a Hotel Room in Nowra? 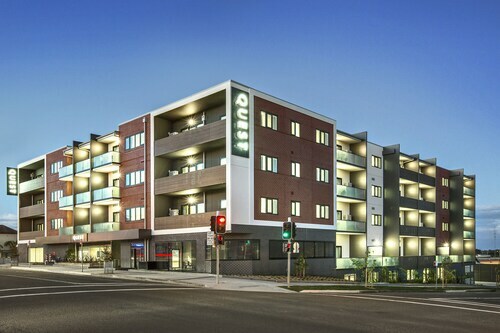 Hotels in Nowra start at AU$110 per night. Prices and availability subject to change. Additional terms may apply. Across the street from the beach. Overall a tidy room though the washroom could be updated. It suited our needs, for what we needed to do, as we had to attend a funeral, and had a look around whilst we were there.